Dr. Doxey Sheldon was educated in California. She graduated from Foothill College, Los Altos, California with her dental hygiene degree. She immediately went back to college at California State University, San Jose, California for a degree in Zoology and Chemistry. She was a Phi Kappa Phi honor society member. In 1976 she entered Washington University School of Dental Medicine in St. Louis and graduated in 1979. Besides starting her private practice in 1979, she also taught in Periodontics, Endodontics and Dental Morphology from 1979-1990. 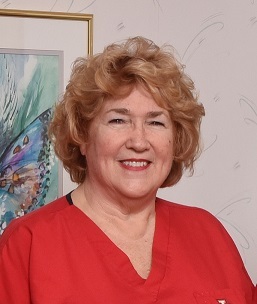 She is owner of Sheldon Dental Group and belongs to many dental organizations. She has published articles on dental microscopy and teaches techniques of the dental microscope to dental professionals. Her hobbies include swimming and designing.